John Calvin, the father of Presbyterianism, and maybe sometimes kind of a controlling jerk. In the summer of 1536, a young philosopher and theologian named John Calvin, having recently gotten himself into trouble in his native Catholic France by writing about his unique brand of Protestantism, arrived at an inn in Geneva, Switzerland. While there he was approached by a local church leader who begged him to remain in Geneva to help him organize the new Protestant church there. 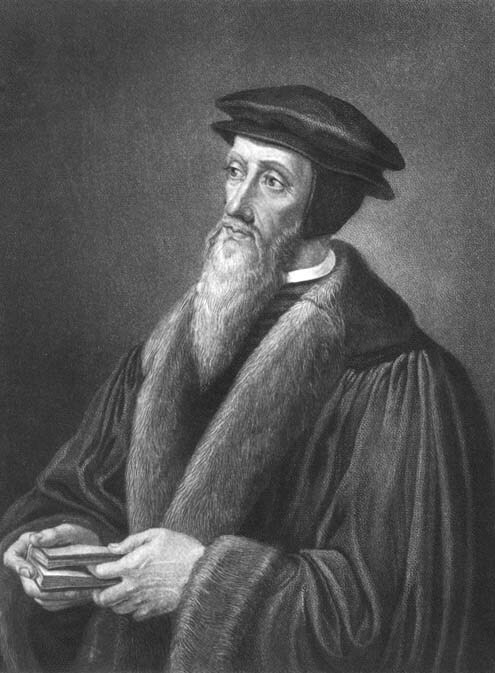 Suspecting that it may have been predetermined by God that he do so, Calvin agreed and spent much of the remainder of his life (after being thrown out of Geneva for a few years because he kind of acted like a controlling jerk) preaching and teaching, setting in place a theocratic system of pastors, doctors, elders, and deacons, each dedicated to over-seeing different aspects of running Calvin’s idea of a perfect society. He was remarkably influential, his ideas in some respects giving rise to capitalism, individualism, and democracy. Still, today, we’d probably call him a controlling jerk, and so did many of his contemporaries. Loudly. Sometimes over the sound of his preaching, and for many years after. The English philosopher Tomas Hobbes, writing in his controversial Leviathan nearly 100 years after Calvin’s death, was critical of the Presbyterian political design. Sometimes considered the father of modern political philosophy, Hobbes was pretty sure that not only had Calvin been a jerk, but that so were all the bishops ruling within the Church, and, well, basically everyone else, too. Thomas Hobbes, father of modern political philosophy, and pretty sure you’re kind of a jerk. Hobbes promoted the idea that humans were little more than machines, designed to act only in the interest of the self and this informed his political views. 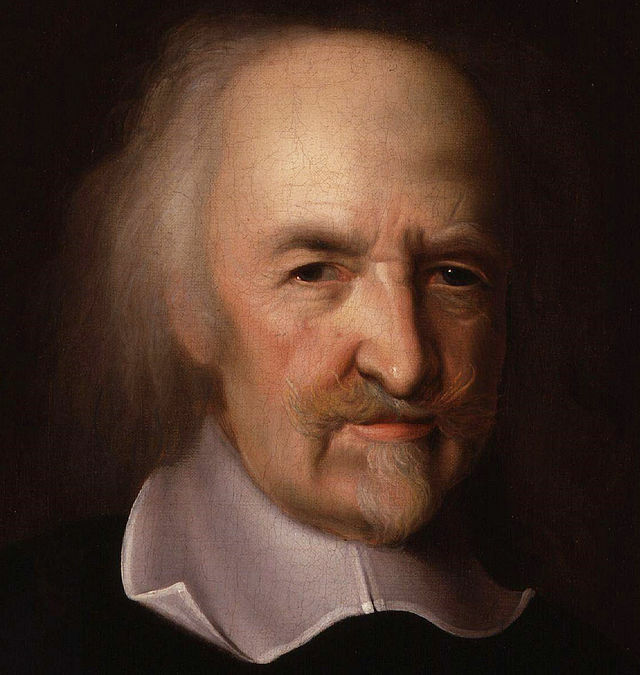 His words were influential, often as a starting point for debates by more reasonable philosophers, who mostly thought Hobbes was kind of a pessimistic jerk. But about three hundred years after his death, and more than four hundred years after the death of John Calvin, both men were honored in the personalities of two of the most beloved philosophers of modern times, when the world was introduced on November 18, 1985, to a six-year-old boy with spiky yellow hair and a stuffed tiger, who was the best friend a kid could have. Bill Watterson, the creator of Calvin & Hobbes, explained in his 1995 book celebrating the tenth anniversary of the comic strip, that he’d chosen the names from these two historical men. He doesn’t offer a great deal of explanation as to why, only that Hobbes the tiger seems to express a certain mistrust of human nature that shows up from time to time as his apparent pride in not being human himself. Calvin, Watterson claims, is based more or less on his adult self, as he grapples with big questions through the metaphor of tenacious, bratty childhood. Though the strip ended in 1995 and Bill Watterson makes it a point to remain private and with very few exceptions, irritatingly aloof, the characters of Calvin and Hobbes have remained in the public consciousness, because between the laughs, the strips are really about friendship, imagination, and growing up. In the midst of funny childish games, Calvin and Hobbes speak to certain human truths. 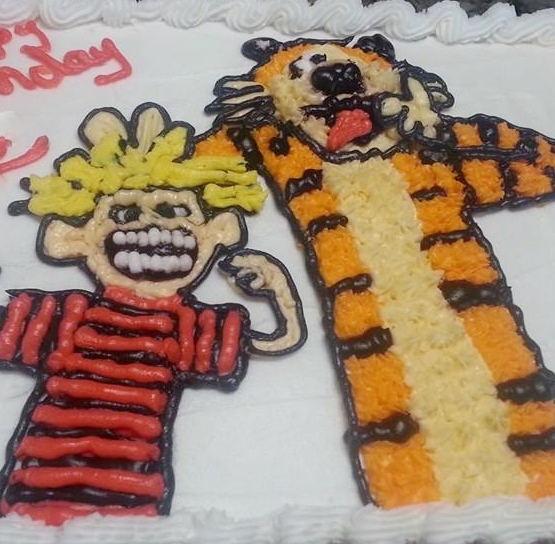 My seven-year-old philosopher’s last birthday cake, on which Calvin & Hobbes look a little bit like jerks. Right now, in my home, the largest truth they speak to is that a little boy with spiky yellow hair and a wild imagination really can provide profound wisdom disguised as disarming charm, sometimes without even knowing it. My youngest son, a spiky-yellow-haired seven-year-old philosopher, is a huge fan of Calvin & Hobbes. He spends hours poring over the various collection books and I think he knows every strip by heart, turning over each one in his mind, sharpening his already impressive wit and gleaning some very useful advice. The day he marched into the kitchen and asked me for a chainsaw, and in lieu of that, a cookie, I knew I was in trouble. He stood there with his clever grin, assured of his predetermined success. Tucked under his arm was his constant companion, a small stuffed rabbit named Bunny (because my son, though wickedly clever, can’t name many 17th-century philosophers). I suspected Bunny might be the real mastermind behind the great cookie plot; that she somehow played on my son’s greedy human nature and put him up to it. That would be just like her. As thoughtful and devoted as she is, sometimes she’s kind of a jerk. I gave him the cookie. 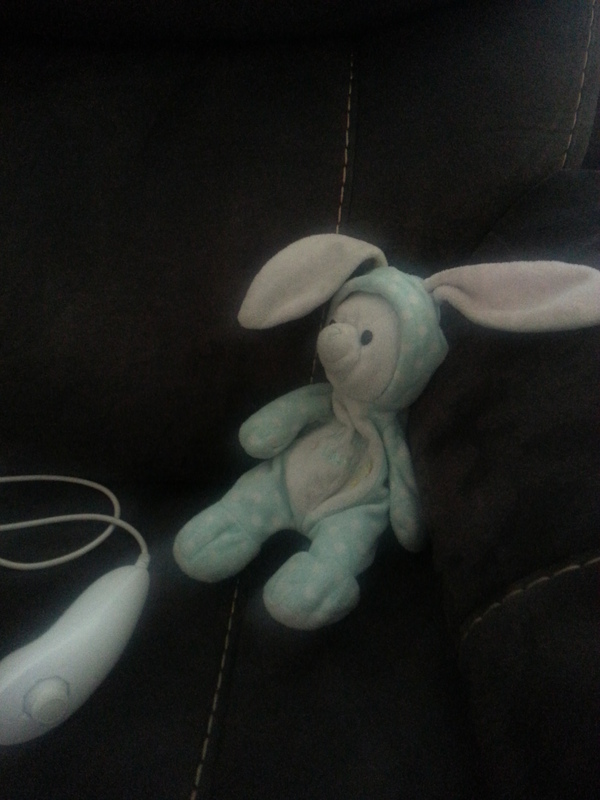 My son’s “Hobbes,” a stuffed bunny he appropriately named “Bunny.” Sure, she looks all innocent sitting on the couch waiting for him to come home from school, but don’t be fooled. The second he comes through that door, she’ll pounce. Because sometimes, she can be a real jerk. Great post! I had no idea Calvin & Hobbes were named after . . . Calvin & Hobbes. (There’s my lightbulb moment for today!) I loved that comic. Still do. And aahh, Thomas Hobbes . . . he’s a real peach, isn’t he? I remember having to slog through The Leviathan for one of my political science classes in college. I figured out pretty quickly that I didn’t want to have anything to do with philosophy, political or otherwise. Cheers!! Thanks! I’m fortunate to have only read excerpts of Leviathan. I’m guessing Hobbes was never exactly the life of the party. Fortunately, Watterson’s Hobbes is much more lovable. I too, never made the connection, although in this busy life I have to submit something vaguely familiar rang through, but I just couldn’t put my finger on it. You did! Thank you. I am the grandmother of a Calvin and Hobbes fan. Wonderful post and thanks for the heads up on the “chainsaw” strategy. I considered offering him the chainsaw box, just to see what he would do. But then I got worried he’d be okay with that. It’s fun living with a Calvin. Most of the time. Thank you! He certainly can be a handful. Your home is so … interesting. My husband loves C&H, has two complete sets, one in original wrappers, the other to read. To those who know him, it’s no surprise.